Sean Masaki Flynn republican candiidate for the 31st congressional district. Inland Empire, CA – The Sean Flynn for Congress campaign released its first television commercial today. In the ad, 31st congressional district candidate Sean Flynn outlines his background and how he differs from his opponent, Representative Pete Aguilar. After immigrating here, my family relied on food stamps to get by. But with hard work, I earned a PhD and wrote a book on economics. 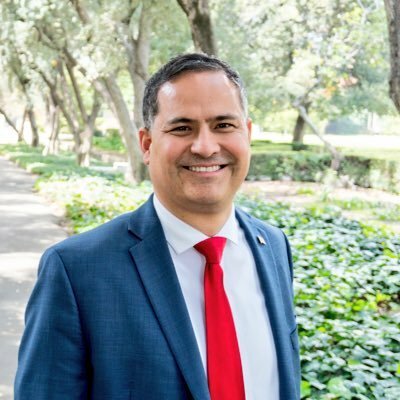 Politicians should read it – especially politician Pete Aguilar. He votes in lockstep with Washington insiders for higher taxes, and even wants to raise the gas tax. I know how families struggle. And I’ll make YOUR life more affordable. Sean Flynn is a recognized economist, educator, and business owner. He is the best-selling author of Economics for Dummies. He is also co-author of the world’s best-selling college economics textbook, Economics: Principles, Problems, and Policies. Flynn currently serves as a board member on the San Bernardino County Employees’ Retirement Association (SBCERA). An avid martial arts enthusiast, Flynn is also a former U.S. National Aikido Champion and coach. The 31st Congressional District includes all or portions of Upland, Rancho Cucamonga, Fontana, San Bernardino, Highland, Redlands, Loma Linda, Grand Terrace, Colton, and Rialto. The General Election is on Tuesday, November 6th. For more information on Sean Flynn and his campaign for Congress visit www.SeanFlynnforCongress.com.